He was born in Calcutta, West Bengal. 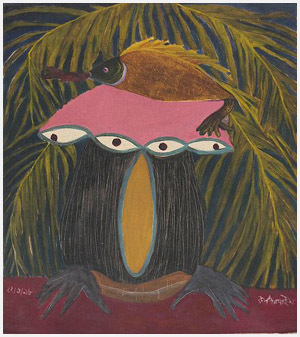 1961 Joined `Society of Contemporary Artists`, Calcutta. 1974,76 Maha Koshla Kala Parishad, Raipur. Published a short biography in `Desh`, a Kolkata weekly. Lives and works in Kolkata. 1955 Diploma in Fine Arts, Govt. College of Art and Craft, Calcutta. 1961 Exhb., AIFACS, New Delhi. Art Mosaic Exhb., Calcutta. 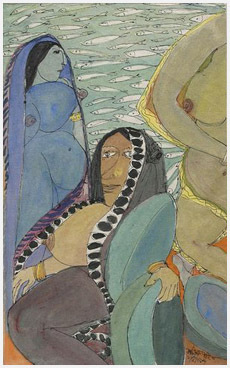 1967, 80, 82 Exhb., Academy of Fine Arts, Calcutta. 1968-87 Exhb., Lalit Kala Akademi, New Delhi. 1968 Exhb., Jehangir Art Gallery, Bombay. 1979 100 Years of Modern Indian Art, Fukuoka Art Museum, Japan. 1988 Drawing Exhb. in Chandigarh. Exhb., Arressa and Chitrakoot Art Galleries, Calcutta. 1991 Calcutta 300, Birla Academy of Art and Culture, Calcutta. 1991, 92, 93, 95, 97, 2001 Exhb., Chitrakoot Art Gallery, Calcutta. 1992 Exhb., Gandhara Art Gallery, Calcutta. Exhb., Indian Council of Cultural Relations, Bangladesh. 1993 Exhb., Bajaj Art Gallery, Bombay. Asian Art Exhb., Chitrakoot Art Gallery, Singapore. 1994 8th Triennial India, Lalit Kala Akademi, New Delhi. 2003 Manifestations, organised by Delhi Art Gallery, World Trade Center, Mumbai and Delhi Art Gallery, New Delhi. National Gallery of Modern Art, New Delhi. Air India, Mumbai. Govt. of West Bengal Gallery, Kolkata. Birla Academy of Art and Culture, Kolkata. Singapore Govt. Museum, Singapore. Delhi Art Gallery, New Delhi. 1966, 69, 73, 76 Award, Academy of Fine Arts Award, Calcutta. 1968-69 Scholarship from Academy of Fine Arts, Calcutta. 1980-86 Scholarship from Indian Cultural Trust, Calcutta. As an artist, he is more concerned with experimentation than arriving at a fixed style of painting. He believes in exploring the multifarious nature of artistic forms without being conscious of their legacy.